We just finished analyzing evidence from our crime scene in 2nd grade. Felix's body disappeared from the crime scene and it is up to us to figure out who did it. So, we had a trial. It was so much fun! I scripted a few pages to get everyone going, but once they started, they didn't want to stop! I have quite a few actors and actresses! If you have never used a "mock trial" in your classroom, you should give it a try. It will really work at any grade. There are tons of resources online for fairy tale "mock trials" to get you started. Then you can pick your topic. Science A to Z has debate/argument questions that would work great for a science topic. 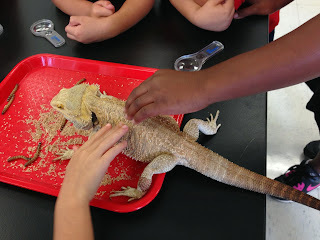 In kindergarten, we used our observation skills with superworms and Big Daddy, one of our resident bearded dragons. Next week, we learn about owls and check out an owl pellet. Ewwww! I am really enjoying all your posts! 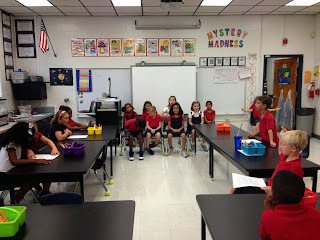 I am a K-5 science lab teacher as well. We are going to do owl pellets very soon too with 5th grade for food chains! Love owl pellets. Check out kidwings.com for virtual owl pellet dissection and owl information!